Buy Nonbinary Wiki a Coffee. ko-fi.com/nonbinarywiki - Ko-fi ❤️ Where creators get paid by fans, with a 'Buy Me a Coffee' button. 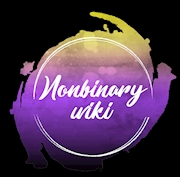 The Nonbinary Wiki is a free online information resource devoted to the education about nonbinary gender identities. As of September 2018, we have over 300 pages about this topic, and we continue to grow day by day. We are, and always will be, a free online resource, but we have ideas to promote and improve the project that require some economical investment. Welcome to our Ko-fi Page! If you enjoy our contents, please consider supporting the project. All our content is created by volunteers, and all funds raised will be used for promotion and other ways to improve it. Thank you for your support! Secured Payments. Support goes to Nonbinary Wiki's account. Upgrade Nonbinary Wiki to a yearly Gold Membership with a one-time payment.